Air compressors are heavy-duty pieces of equipment that often operate at high temperatures and release fumes that could be hazardous for you and your employees. Excessive heat can also lead to performance issues with your unit. There are two preferred ways you can control the heat surrounding your air compressor in Bakersfield. A good ventilation system will remove the heat produced by your air compressor so that it can operate safely and efficiently. Ideally, you want vents that are minimally affected by the weather. You can do your part by setting up weather-protected vents on the lower half of the space. Also, it’s a good idea to avoid installing vents in a wall that faces the sun as this can lead to additional heat intake. The size of your compressor and the designated space will determine how many vents you need. If you’re not sure, work with an air compressor professional to set up a proper ventilation system for your unit. Climate control is another way you can help keep the area surrounding your air compressor cool. If possible, keep the room cooled whenever the compressor is operating. This will help alleviate some of those heat-related problems that are associated with air compressors. 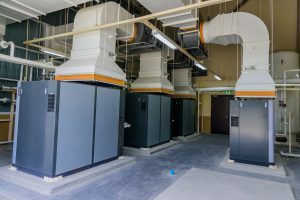 Cool air also has less moisture than warm air, so if you decide to place your air compressor in a climate-controlled environment, you’ll also be protecting the unit from damage that often occurs with extreme moisture. Want to learn more about how excessive heat can impact your air compressor? Contact NB Sales and Service of Bakersfield today.